Last time, we showed off some creative ways that you can decorate your house for Halloween with the classy yet creepy Eerie Elegance theme – click here to check out our decorating tips if you didn’t catch them the first time around. Today, we’re taking this theme outdoors to complete the total package. 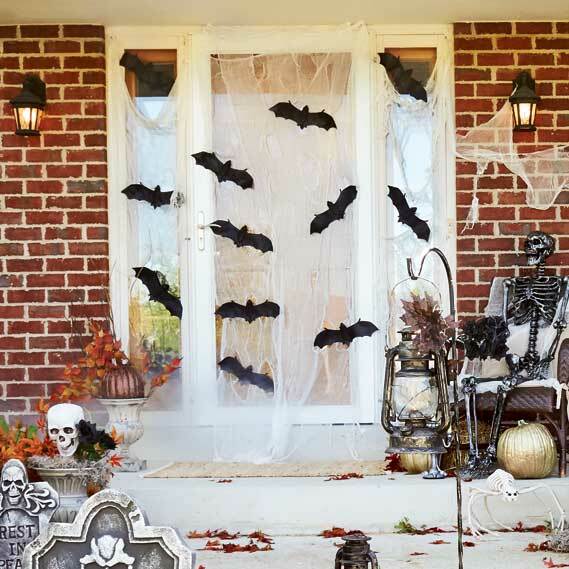 With just a few simple props, it’s easy to haunt the outside of your house as much the inside. Keep on reading to see our decorating ideas. Make use of lanterns to light the way. 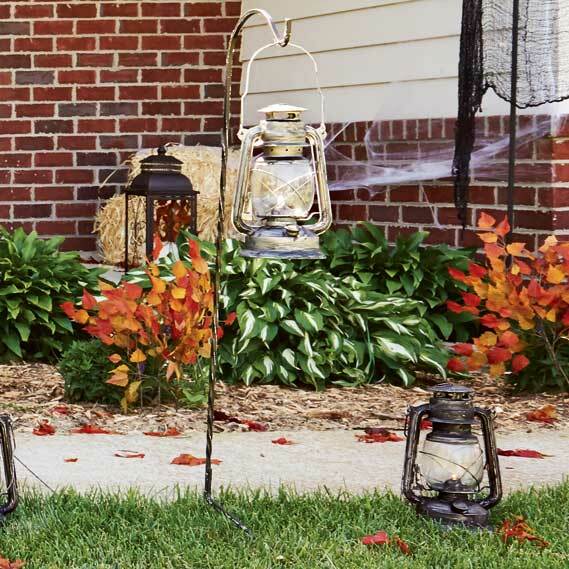 We already mentioned using old-school lanterns (either actual antiques or their battery powered equivalents) as part of your indoor Halloween mood lighting. Well, lanterns are great to use outside, too. 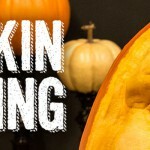 Place some on and around your porch, or use them to line a pathway to your door. 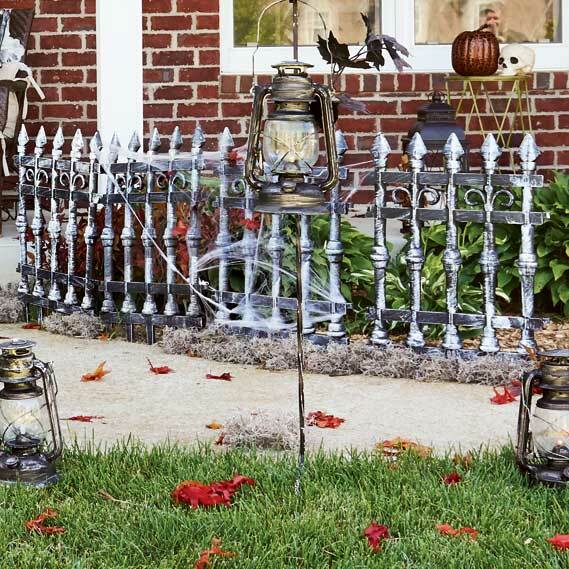 Grab a few garden hooks and swap out the flower pots for a few lanterns for a look that’s eerie in the daylight and even spookier at night. Give your walls a disguise with some freaky fencing. 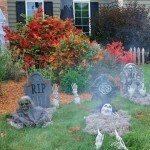 This graveyard fence is another great way to make your yard a little bit spookier. It looks just like an ominous, wrought iron gateway, and can be used to line a walkway or make your wooden picket fence more interesting. Don’t forget to add some creepy spider webs. 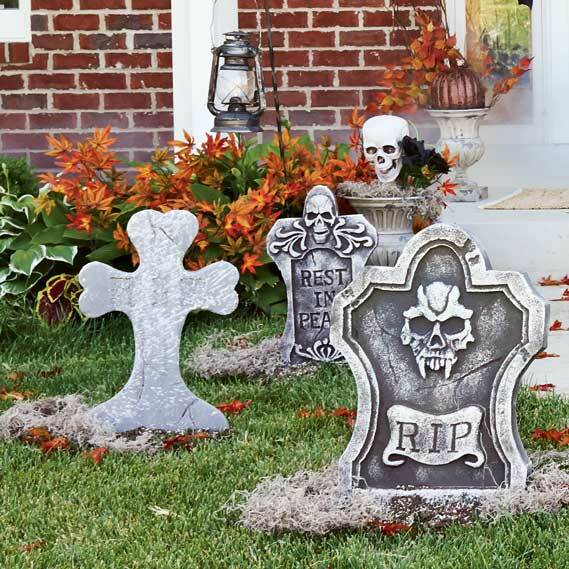 Turn your front yard into a graveyard with fake tombstones. Nothing says Halloween like a creepy, haunted graveyard, and with a few Styrofoam tombstones, you can make your own. Disguise the base of your gravestones with some fallen fall leaves or straw to make them look more realistic. To make sure that they stay upright and don’t blow over in the wind, you can use wooden skewers or long nails to stick them into the ground. Heavier prop tombstones can be used too, if you’re worried about inclement weather – this one even lights up. 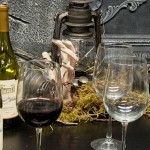 Lifesize props can add a lot of life to your decorations. 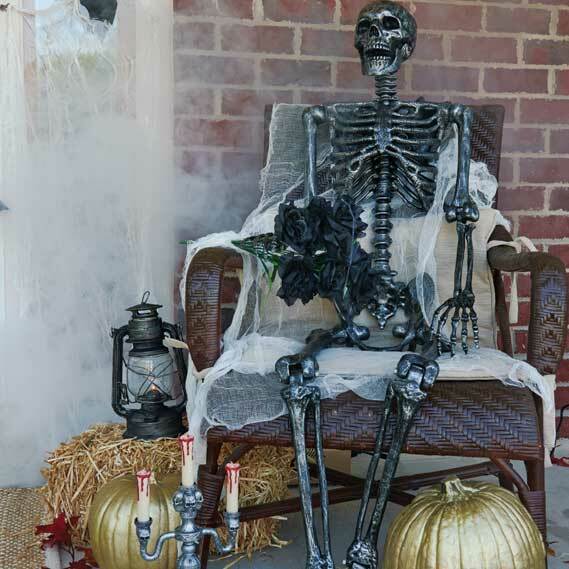 This six-foot tall skeleton is fully articulated and posable at every limb, so you can prop him up any way you please to bring some character to your decorations. We sat ours on an old wicker chair with a gauze drape and bouquet of black roses. You can even use a portable fog machine to get a more cinematic feel. This is also a great idea for taking photos of your decor. Make sure your doorway looks like the portal into the ultimate Halloween party. Your porch and front door are the last things that your guests will see before they enter, and first impressions are extremely important. We used painted pumpkins, skulls and bones, hanging bats, spider webs, and gauzy fabric to create a scary look, but you can do whatever fits for you. Our spooky skeleton friend from above also had a seat out there. 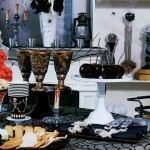 Check out our complete collection of outdoor Halloween decorations for more ideas. 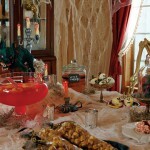 What did you think of our Eerie Elegance Halloween decorating theme? How are you planning on haunting your house this seasons? If you liked this post and want to see more like it, then let us know what kind of Halloween ideas we should show off next – message us on Facebook, on Pinterest, or on Twitter @BuyCostumes to tell us what you think.